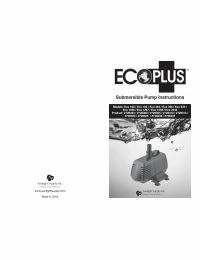 The EcoPlus Eco 100 Submersible Pump is a fixed flow rate, 100 gallon per hour multipurpose pump. EcoPlus pumps can be used many applications, including fountains, ponds, aquariums, and hydroponic systems. Each pump comes with a 120V cord and includes inlet and outlet fittings. EcoPlus pumps are for indoor or outdoor use and should never be let run dry.